Can anyone recommend me a good and hopefully inexpensive thermostat? My bedroom gets really warm during the summer, and I'm having issues keeping the temps good. I have to switch out bulbs for different watts, turn off the basking light, ect multiple times a day, and I'm worried poor Dud will overheat when I am on vacation. I was going to hook it up to my 100 watt CHE, and use some normal flouescent lights for brightness so he doesn't have to stare at his UVB light. Hmm, those don't look too bad. Someone gave me the link to this one though, and it looks pretty good! Jess, what kind of set up are you envisioning? I've never found thermostats useful in controlling light fixtures. Because, for accuracy's sake, you'll need the thermostat to be inside the tank with Dudley, the visible light might not read accurately on a thermostat. A white thermostat will read a different temp than a black one because of the way visible light is absorbed differently by different colors. The angle and surface area exposed to the light will also affect it's accuracy. What's more, you need different heating gradients for different spots. One thermostat won't give you accurate readings across the board. You might find that using a light that doesn't produce heat (like the flourescents you mentioned) is helpful, and having your heat source (heating tape or a heating pad on the side of the cage) controlled by a timer. This gives him a general gradient, from the warm side to the cool side of the tank. You can put the heat source on a timer, because you can roughly predict when the ambient temps in your room will be problematic. For his basking spot, you could use a lower wattage light, but use a spot focus so that it's still warm where he needs it, but it will have less effect on the temps throughout the enclosure. I just wanted something so that to temperatures don't get so high, because Dud is refusing to bask because of the heat. I have a screen door on the cool side, so it has better air circulation, and a glass door on the basking side so I don't need a high watt light. I've tried using a spot light like you mentioned, but I can't find one that is cool enough. Even a 45 watt flood light gets the temps to like 107*F. The smallest belb I could find was a 35 watt halogen, and that get even hotter than the floodlight. So right now I am using a regular 60 watt house light, and even that is getting a little hot. I do have a timer for the night/day light cycle, and I guess I could make it so the basking light is on 30 min, then off 30 min. Thanks for the suggestions! BTW, some one showed me this one too. Is it any better? The probe is black, I think. What about about a lamp with a dimmer? I use thermostats for UTHs but need a basking light in the winter for my snakes because the UTH isn't always enough. The basking lights have dimmers so I can just turn the light down. I'll look into that too. I asked the person at the reptile shop about it today, and she recommended a dimmer too. That second link you posted, the Hydrofarm thermostat is the one I'm currently using on one of my gecko tanks. It works well for the price, but I'm using it on an UTH. It's an on/off thermostat. Which means that when the temperature hits or exceeds your programed maximum temperature, it turns the heat source off completely. It turns it back on again once the temperature dips I believe it's around 2*F under the programmed maximum temperature. So it's constantly turning the heat source on and off according to the temperature readings. It works well when you're using an UTH, but attached to a light it would mean your lights would constantly be turning on and off. Most cheaper thermostats are on/off thermostats. There are also proportional thermostats. They are usually more accurate and instead of turning the heat source off completely, they adjust the amount of power going to the heating element. Pretty much a glorified dimmer that automatically adjusts for you so you don't have to do it yourself. They are usually pretty pricey though. 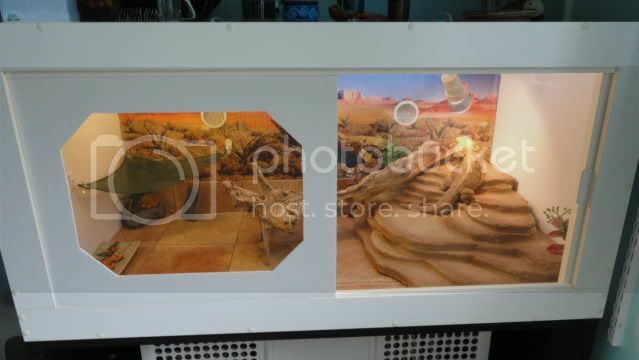 It's been quite a few years since I've owned reptiles that needed any kind of special lighting...but I'd look into using a dimmer if your looking for something to control a light. Last edited by Dragonrain; 07-02-2011 at 03:34 PM. How much heating to you actually need? If your room is getting that warm, it should stay within the comfort zone of your dragon without supplemental heating. I'd explore what you said earlier, just a timer for the basking light. Although 30mins on/of is going to shorten the life of the light significantly. He doesn't necessarily have to have access to a basking light all day long. A lot of desert animals only bask in mornings to warm up. Then again in the evening to get a little last warmth before the cool of the night. For Dudley, as long as the temps don't get too cool in between, an hour of basking in the morning and an hour in the evening might be a good starting point to see what he needs. In the winter, when temps my cool off in your house, you might consider using a ceramic heater in his basking area. That way he can have a warm spot 24hrs/day and you don't have to leave a light on at night and disturb is diurnal cycle. Just some suggestions. Hopefully you won't need a thermostat at all. Well, I realized that I didn't have a seperate timer for the basking light, so I didn't end up going through with that idea LOL. But yeah, I've been turning the basking light off unless he is actually basking, which is usually in the morning/evening. He has been sleeping most of the time for the last couple days. And what I would like to do sometime is to just hook my CHE up to a dimmer, and use that as a basking heat source instead. That would just be easier, because I could just dim in when I need to and never mess with additional bulbs again. Before I switched cages, in the winter I had the timers set so the basking lights were on during the day, and the CHE switched on at night. But thanks for the advice everyone! It has helped a lot. Getting a simple dimmer for the CHE will be a lot cheaper and easier that getting a thermostat.